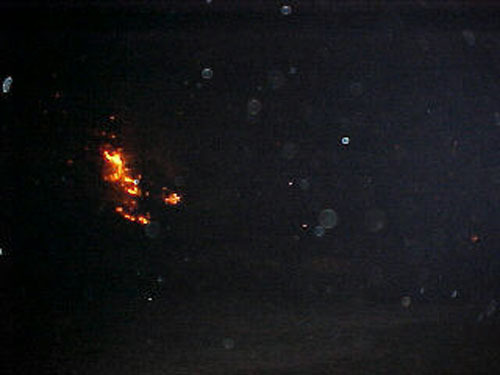 On May 11, 2000 at about 3:30 pm, a fire began in Scott Able Canyon, about 15 miles south of Cloudcroft. The source of the fire was a downed power line. Before being extinguished, the fire consumed 16,034 acres and 64 homes. It also indirectly took the lives of 2 men, who died when their fire spotter plane crashed on takeoff. 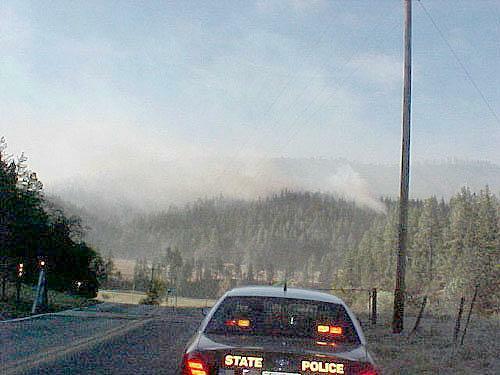 Beginning the first day, Cloudcroft Online provided full-time coverage of the fire. 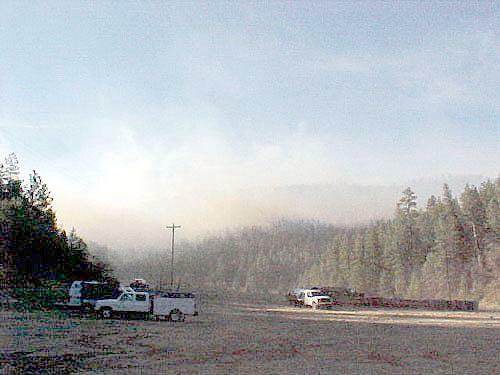 In spite of the fire´s severity and the danger to area residents, other media virtually ignored the fire, concentrating instead on the fire at Los Alamos, which was burning at the same time. Our daily coverage of the Scott Able Fire is given below. Our fire coverage photos are listed below. Here´s a selection of the emails we received during our fire coverage. Here are some really nice photos of the aftermath of the fire taken on May 20 by Diane Bazar. Her son, Michael, has written an interesting account of his evacuation from Bonita Vista at the start of the fire, which is available here. Our thanks to each and every Cloudcroft Online visitor that supported us and contributed to our efforts to cover this fire. 8:00 am MDT — The Forest Service is reporting that 76,000 gallons of retardent has been pumped from the tanker base at Alamogordo and dumped on the Scott Able Fire yesterday. Full containment of the fire is expected today. 8:30 am MDT — How much fault should the government and the National Forest Service shoulder for the Scott Able Fire? Would it have been so bad if the forest had been thinned and underbrush cleared as local residents had been begging for years? Those are questions that will be asked tonight at a community town hall meeting in Cloudcroft. The meeting will be in the Old Schoolhouse (Nevison Library) starting at 6 pm. 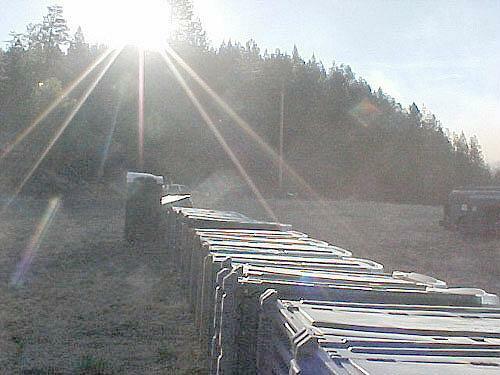 The NFS reports the Scott Able fire 75% contained with 100% containment the goal for today. Winds should cooperate. Forecasters are saying 10-15 mph winds today, but the humidity will remain low. 47 crews, 6 helicopters, 59 engines and a total of 1402 people are involved in the Scott Able effort. The amount of forest burned was lowered yesterday from 20,717 to 16,034 due to more accurate mapping. Despite the terrific wind problems that grounded the slurry planes much of the day yesterday, there were no new breakouts from the perimeter established Sunday. The fire has been feeding on unburned islands of timber within the perimeter. 9:30 am MDT — The Forest Service has already raised their containment figure to 90% this morning on the Scott Able Fire. They say their night crews reported good progress. No new reports of any further property damage or injuries. The fire could be 100% contained by noon. The term “contained” does NOT mean the fire is out. It means a strong perimeter has been established all the way around the fire. Snuffing the fire during “mopping up” operations could take another day or two. The fire began exactly one week ago, in the mid afternoon, when high winds blew down a high power electrical line near the Scott Able 4-H Camp near Weed. 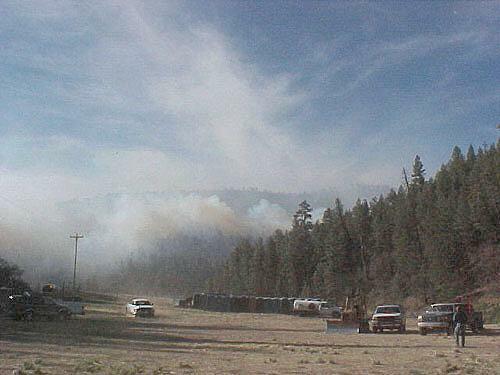 10:40 am MDT — Residents of Hay Canyon are being allowed back into that area today. Residents and support people (gas, electric, etc.) only. Hay Canyon was the last area to remain evacuated. 11:30 am MDT — Calmer conditions in the Sacramento Mountains near the Scott Able Fire site are contributing to quick work in getting the fire completely contained. Cloudcroft.Com has obtained permission to enter the perimeter to take pictures of the damage. We hope to post these pictures this afternoon on Cloudcroft.Com. 4:20 pm MDT — Cloudcroft.Com just returned from a tour of the Scott Able Fire. Except for mopping up operations, the fire is essentially out. Pictures of the devastation appear below. 5:50 pm MDT — When Otero County Sheriff’s Office deputies told Alton Posey that he and his wife would have to leave their home because a fire was coming their direction on Thursday, May 11th, he said his wife would be leaving, but he was staying to fight Mother Nature for his home. The Scott Able Fire had been kindled only minutes before and it was obvious it was going to be a significant blaze. The winds were high and the forest was dry. The fire would own the forest and everything in its path. Everything, that is, but Alton Posey. Alton is a lifelong resident of these mountains. He has had extensive fire fighting experience, so it wasn’t out of ignorance that he decided to risk his life to save his home in Agua Chaquita Canyon, near Weed, New Mexico. He told his wife just before she left that he would be fine. He loaded his dog “Ugly Baby” into his pickup and pledged to his wife that “he and Ugly would jump in that truck and get the hell out of there at the first sign of danger.” Alton had second thoughts, though, and just before his wife pulled out of the drive, he loaded Ugly Baby in with her to be evacuated. Even with Posey’s experience with past fires, he was taken totally by surprise by the speed at which this fire traveled toward his home. Winds, whipped by the flames, reached an estimated 100 mph. Posey used a garden hose, filling buckets and washing down his out buildings first. They were the first to be threatened by the conflagration. Suddenly, realizing the fire had completely surrounded him, he knew his only hope for survival was to beat the forest fire. “Alton had two things in his favor” said Pat Boss, spokesman for the National Forest Service. “His house was isolated from the heaviest stand of trees a little, and he didn’t know the meaning of the word ‘quit'”. From sundown until 3:30 am Friday morning, armed only with a small garden hose and buckets, Posey held back the flames. At one point, as he came around the corner of his barn, he was knocked flat by a deer running for safety. On two other occasions, the flames and smoke became so thick that he was forced to lay flat on the ground in an attempt to find breathable air. 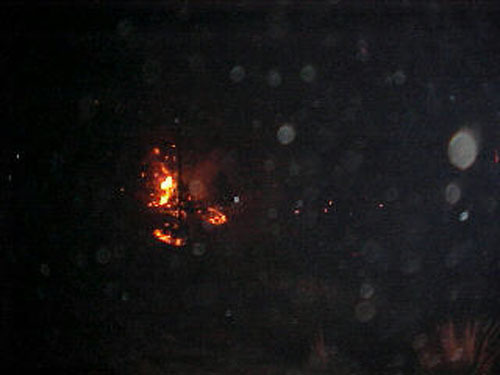 While the Scott Able Fire would cause misery and destruction for a whole week before being contained, Alton Posey’s battle with the blaze began and was over in the first 6 to 8 hours of the fire’s life. 6 to 8 very hellish hours. Alton Posey and his wife and Ugly Baby now have house guests. Two families from neighboring homes that burned down. When we left Posey this afternoon, he was back to business as usual, trying to talk Otero County Electric officials out of some damaged utility poles they had replaced. “I could really use them around my place” he said. Photos of Alton Posey, Ugly Dog, and his unburned home. 9:00 pm MDT — The Scott Able Fire is 100% contained. Two people died in fighting this fire. Cloudcroft.Com will provide updates as the situation dictates. The estimated loss due to the fire is $2,800,000. The cost to date of firefighting efforts is $3,545,000. The May 18 Forest Service press release is here. A grass fire near Roswell has killed one person and burned 1,200 acres so far. The Albuquerque Journal has an article on the fire.